Higher Education Commission in Pakistan released its first and only ranking of universities in Pakistan in October 2006. Prior to this HEC effort, there had been no formal attempts by any public or private group to establish a set of criteria and judge Pakistani institutions of higher learning. While this is a laudable first step in the right direction, it is clearly not the be all and end all of the universities' ranking process in Pakistan. It can be significantly improved. As expected, there is a genuine controversy swirling in Pakistan on the HEC ranking methodology and the results. This ongoing controversy may be the reason why the HEC skipped the annual rankings in 2007. The main criticism of the HEC assessment criteria is the emphasis of quantity over quality that unduly favors and rewards institutions with large graduate programs. Another key criticism is the lack of peer and employer assessments of the universities and their alumni. NEDUET, being predominantly an undergraduate institution, is among the universities that have shown up near the bottom with a meager score of 18.65 out of 100. Since such rankings have only been done once, it is hard to say if the standards of any of the institutions on the list, including NED Engineering University, have risen or declined. You need at least two years of data to draw such conclusions based on the criteria used by the HEC. A panel discussion about "Declining Academic Standards at NEDUET", planned for the upcoming NED Alumni Convention 2008 in the US state of Connecticut, apparently accepts NED University's ranking and assessment of HEC on its face value. As an NEDian myself, I am not advocating denial or defensiveness in response to the low rank of NED by HEC. Instead, I firmly believe that there is a need for further exploration of this subject before reaching any definitive conclusions about "declining standards" or making any recommendations. Some readers might ask why should the universities be ranked? I am not certain as to the HEC rationale for it, but I can see several reasons why it is a useful exercise. First, it helps the students and their parents select the institution they should attend based on a set of criteria. Second, if the criteria are clearly laid out and objectively measured, it helps the universities identify areas of improvement to become better at educating students and conducting research. Third, it can be used by the industry and the employers to target specific students, programs and projects for hiring and research. One-size-fits-all ranking criteria that lump together graduate and undergraduate programs in a variety of unrelated disciplines are not particularly helpful to any of the potential users including students, parents, employers, researchers etc. As an example, the ranking criteria used by US News and World Report, the most widely used rankings in the United States, separate out undergraduate programs from graduate programs. The USNWR graduate program criteria have heavy emphasis on research and publications while the undergraduate program criteria do not. Other key criteria used by USNWR include peer assessment and employers' and recruiters' feedback on the universities and their alumni. As a student of Karachi's NED University of Engineering and Technology in 1970s, I had similar assessment of my alma mater (and other UETs) in Pakistan as Zakaria's characterization of the IITs in India. NED Engineering College in 1970s was "decidedly second-rate, with mediocre equipment, indifferent teachers, and unimaginative classwork". However, given the fairly strict merit-based admission process, I found myself mostly surrounded by some of the best, most competitive students who had graduated with flying colors from Karachi's intermediate colleges and ranked very high on the Board of Education examination to make it into NED College. It was indeed the creme de la creme of Karachi's youth who have later proved themselves by many accomplishment s in various industries, including some of the leading-edge high-tech companies in America. Even in the 1970s, there were a small number of students admitted on non-merit-based special quotas. NED University today, however, appears to have significantly expanded such special, non-merit-based, quotas for entrance into the institution, an action that has probably affected its elite status, its rankings and the perceived quality of its graduates, while other, newer institutions of higher learning have surpassed it. Some of the special categories now include sons and daughters of employees, children of faculty and professional engineers and architects, special nominees from various ministries and an expanded quota for candidates from rural areas and the military. 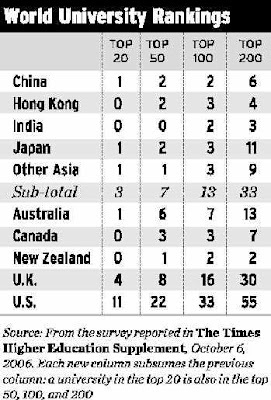 Looking at the top 500 universities in the world, one can see a few universities from China, Japan, Singapore and India and a few more from Muslim nations such as Malaysia, Indonesia, Turkey, Iran and Pakistan. The notable institutions from South Asia include several campuses of the Indian Institutes of Technology and Pakistan's National University of Science and Technology (NUST), University of Lahore, Karachi University and Lahore's University of Engineering and Technology. The top Pakistani school on this list is National University of Science and Technology (NUST) at #376, followed by University of Lahore, University of Karachi, and UET Lahore. Many new universities are now being built in several Muslim nations in Asia and the Middle East, and they are attracting top talent from around the world. For example, King Abdullah University of Science and Technology (KAUST), scheduled to open on Sept. 23, is the country's attempt to create a world-class research university from scratch. It's hiring top scholars from all over the world. "Our goal is to kick-start an innovation-based economy," says Ahmad O. Al-Khowaiter, the university's vice-president for economic development. "We need a couple of success stories, and we think this will lead to one (collaboration with IBM Research)." With the score of 18.65/100, NED University, the oldest institution of higher learning with many successful alumni and an illustrious history, is ranked at number 10 out of 13 engineering universities in Pakistan. NED University has been assessed by HEC on criteria that favor universities with strong graduate programs that award a large number of Ph.D. and M.S. degrees. It ignores recruiter (employer) assessment that speak to the quality of NED University alumni. It also discounts the accomplishments of NEDians diaspora that attest to the quality of education they received at NEDUET. Clearly, the NEDUET's low ranking is based on its lack of a strong graduate program. Under the current HEC criteria, more Ph.D. faculty and students enrolled means higher ranking. More research papers means bigger score. In fact, it would not be inaccurate to say that HEC is using the number of PhDs at various institutions as a proxy for the state of higher education in Pakistan. It may be useful to encourage more and bigger graduate programs enrolling and producing more PhDs. But there is a danger in playing the numbers game. The quantity must not be allowed to degrade quality. Encouraging production of more Ph.D.s and research papers by HEC and its financial incentives have come under heavy criticism by Dr. Pervez Hoodbhoy and many others (See related links below). It has led to lowered standards for Ph.D.s and instances of plagiarized papers at Punjab University ranked number 2 among general universities, just below the top-ranked Quaid-e-Azam University with a large number of Ph.D. faculty members and students. According to Professor Hoodbhoy, there are as many as 18 PhD students registered with one supervisor in QAU's Physics department! In the QAU biology department, that number rises to 37 for one supervisor. HEC incentives have helped dilute PhD qualifying exams to the point where it is difficult for any student not to pass. 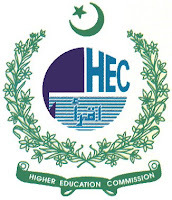 HEC is reportedly paying as much as Rs. 5000 per month per Ph.D. student to supervisors as incentive to produce more Ph.D.s in Pakistan. HEC grants to universities are also based on the number of Ph.D. students enrolled. HEC has made a good start by attempting to formalize a process by which academic institutions can be judged and ranked. But the HEC must not stop at rev 0. It must continue fine-tuning the ranking criteria and the process to provide better and more useful feedback to the institutions. HEC must initiate and manage the effort to make Pakistan's institutions of higher learning more competitive internationally, and help the students become better prepared to make greater contribution to society by responding to major national challenges such as the energy and food crises, poor governance, bad urban planning, climate change, etc. Just producing more PhDs will not be particularly helpful to a nation beset by multiple crises. I think it's important for the HEC to establish separate criteria for undergraduate and graduate engineering programs to be fair to all colleges and universities including NED University of Engineering and Technology. There should be two separate rankings published for undergraduate and graduate engineering programs. These should be completely separate from non-engineering universities. At the same time NEDUET should work to beef up its graduate program with more resources in terms of faculty, facilities, student enrollment and research and publications aimed at overcoming the major national challenges of the day. NEDUET leadership needs the vision to pick one or two major national challenges and respond to them by developing the expertise and excellence required to succeed. The NED alumni can, and should, help in this endeavor with a lobbying effort to improve NEDUET leadership and governance, an alumni-managed endowment fund and alumni-sponsored industry alliances around the world. I appreciate your addressing the thorny issue of falling education standards at NED but I don't think you need to apologize on NED's behalf. At NED, I have been a student and later served in teaching and administration, so I should know what I am talking about. I would like to point out that HEC's ranking is both honest and factual. They judge it, not so much by the criteria you suggested, but by audit of the amount of money spent by Government of Pakistan, per student each year and by the overall performance of faculty, including research training offered to students or publications at international level. At NED, unlike other Pakistani Universities, teachers spend more time working part time outside, than at the campus. If you were to visit a teaching department after 1:30 PM it is unlikely that you will find anyone present. Also, HEC has a hidden criteria of tracking which universities award degrees by 'mock' exams or award highly inflated marks to almost every student, who may or may not even attend classes. "You cannot fool all the people all the time". During 1960s we had a certain standard of decency/honesty. I left the alma mater because I did not enjoy that kind of music and also because I was not a V.C. 's chamcha. "Where ignorance is bliss it is folly to be wise." I, too, graduated from NED Engg College with a BE in EE in mid-70s and taught there briefly as adjunct faculty before going to grad school in the US. 1. NED is fundamentally not a research university. It is an undergrad school that's being compared with research universities with large graduate programs. It should be judged on criteria more appropriate for an undergrad school. 2. Since the HEC has done its assessment once and never repeated it, it is hard to say if NED is rising or declining based on the HEC criteria. 3. The heavy HEC emphasis and incentives on producing more Ph.D.s and more research papers are adversely affecting quality and encouraging corruption in academia. Individual faculty supervisors are taking on as many as 15-30 Ph.D. students to get Rs. 5000 per student per month. There have been many well-documented cases of plagiarized research papers because each paper earns Rs. 50,000 from HEC. These numbers have also helped universities such as Quaid-e-Azam U and Punjab U get higher rankings. It is simply triumph of quantity over quality. In other words, the system is being gamed by a few to bring disrepute to many. My contact with UGC and Ministry of Education was during 1980s when I was preparing a PC-1 for NED's development project and when Dr. A. T. Khan was V.C. 1. All universities, including NED UET, by virtue of their statutes have mandatory requirements for teaching and research. NED was upgraded from a college level to full fledged university in 1976. I have not come across the terminology of a "research university". Do all the enrolled students carry out research without taking graduate courses? Please note that NED receives a huge grant for for their graduate programs, for publications and for research projects. 2. HEC regularly does the yearly assessments. The results are sent to the universities. Detailed back up of their evaluation is maintained. They are very good at record keeping. Please try to understand the chain of command within the Government of Pakistan. Chairman of HEC has the status of a Federal Minister. On behalf of the Prime Minister, he approves funding each year, after overseeing progress based on university's report card. The audits are of a high level both for academic performance and for the use or misuse of funds. There must be over a hundred officers engaged in this task alone. The laws of the land are made by the Parliament. 3. I wish what you say were true. How come NED or Mehran's faculty does not supervise 15 - 30 Ph.D students. The take home income of an Associate Professor is over one lakh rupees, thanks to HEC. They have all kinds of funds. In fact two grants each year were approved for research in "earthquake resistant design of buildings" by USAID based on our committee's recommendation (in the report submitted for reconstruction after 2005 earthquake). I currently have two research students (on integral abutment bridges and on foundation scour countermeasures) at Temple U. although I would like to have a few more. My objective is not to defend NED, nor to attack it. I am simply trying to understand and rationalize the HEC agenda, methodology, criteria and how NED is being assessed and ranked, as part of a panel discussion at NED Alumni Convention in Connecticut this weekend, along with several NED faculty members, deans and pro VC. Hopefully, if we can come up with a coherent list of things, the NED alumni in the US can start to help our alma mater. In the US, the terminology "research university" is commonly understood to mean universities which do advanced research and have a significant number of professors and students engaged in it at the graduate level. Such universities are often known for certain specialties such as communications, life sciences, IT etc. For example, in California, the UC system's UC Berkeley and UCLA are considered research universities while CalPolys and CalStates are not. They have different missions and objectives. Even within research universities, graduate and undergraduate programs are judged separately based on different criteria to rank them and provide feedback by various ranking outfits, among them US News and World Report that is the most popular. The ranking is not meant to praise or bash any one. It's purpose is to provide feedback and guidance to faculty, staff, students, parents (both current and prospective). I do not disagree with you that HEC does have its criteria and methodology; I just don't think the criteria make sense in terms of the realistic objectives. It seems that HEC's only objective currently is to increase the number of Ph.D.s and produce more research papers regardless of whether any national challenges or the quality criteria. I can understand an adviser with 2 or 3 or even 5 Ph.D. students. But 15-30, as seen at QAU, makes no sense other than to enrich the adviser with extra money through HEC's misguided incentives. The same is true for professors plagiarizing papers ( such as at Punjab U) out of personal greed rather than serious research. Such tactics have in fact been encouraged by HEC's emphasis on quantity rather than quality or purpose. 1. HEC should set some national priorities based on the major challenges Pakistan faces such as food, energy, governance, urban planning etc. and encourage genuine research in these areas by setting up focused research centers at various universities including NED. Just producing more Ph.D.s in Particle Physics or other such areas should not be the priority. 2. Experts in the focus research areas should be invited to participate and get serious research started with clear vision to help the nation deal with its crises. HEC should try and help coordinate such research with various research institutes in Pakistan and overseas. 3. NED should pick an area such as energy or urban planning and strive to become a center of excellence in it. Hope it helps clarify my objectives and key points. I recently graduated from NED University, and served as an Adhoc Lecturer for around 10 months, before leaving for my MS/PhD studies. I would like to disagree with two points made by Mr. Mohiuddun. >> If you were to visit a teaching department after 1:30 PM it is unlikely that you will find anyone present. This is definitely not the case during Mr. Abul Kalam's tenure. And during all my four years as student and then as lecturer, I have never seen any teacher leaving the university before 3:30 PM (official university closing timings are 4:00 for undergraduates). There are strict (a bit too strict regulations in this regard!). >> The take home income of an Associate Professor is over one lakh rupees, thanks to HEC. This is true only for HEC's recently approved 'tenure track' program, and less than a dozen faculty members are actually availing (or are eligible to avail) this. Otherwise, usually Associate Professor positions pay around Rs. 45k, while a 1-2 year experienced NED graduate is usually able to make this same amount in Karachi (like many of my classmates). At the end, I would say that I completely agree with Mr. Riaz's analysis and recommendations, and hope HEC takes notice of the situation and follows it. Its sad to say , but what i have seen that the day you are graduated from NED..next day you are Indulge as a lecturer ...(they only see that you are a position holder)..What i believe that to be a good teacher you dont have to a position holder...and a position holder cant necessarily be agood teacher..
"we have studied in the same manner...so plzz study in the way we did"..in short she didnt know the answer...! !>..so what can we do..?? @Mohiuddin A. Khan: "During 1960s we had a certain standard of decency/honesty." Very true. Honesty, and just examining is absent at NED. NED deserves its low rank. There may be isolated incidents of dishonesty and treachery, but I generally see many NEDians perform quite well in the competitive environment in Silicon Valley, and elsewhere in the US. I'd say most of them have achieved what they have through sheer hard work, and at least some decent contribution by NED faculty and staff. I sympathize with your predicament but I don't agree with your generalization. I must clear that I was talking in perspective of the current situation of NED. At the undergrad level, dishonesty and treachery 'is' taking place in a very systematic way. One test for the whole university is clearly un-inventive and lazy. The assignments that we are given are the same since 1985. A photocopy of the solutions is all it takes to solve them. Is this called education. The NED alumni may be great; but currently, the university is headed in the wrong direction. 1.sessional marks criteria is undefined in ned yet teacher can give any marks to anyone. 2.No student and teacher relation is established yet....eyen students do not know the name of the teacher at the end of the year...believe me its true. if an engineering teacher do nat have the field experience how can ho teach us or connect us with the real world? 5.NED faculty is not paying attention to extra curricular avtivities....they still think that reading books is the only way to lead "PAKISTAN"
PIEAS IS THE BEST PAKISTANI ENGENIERING UNIVERSITY. The Times Higher Education Supplement for 2011 ranks 6 Pakistani universities among the top 100 Asia for Life sciences and Bio medicine. NUST ranks 60, UET-Lahore 65, Karachi University 68, University of Lahore 73, Punjab University 91 and Quaid-e-Azam University Islamabad at 94. On THES IT and Engg rankings, there are 4 Pakistani universities: NUST is 47, Univ of Karachi 91, University of Lahore 89, UET Lahore 90.